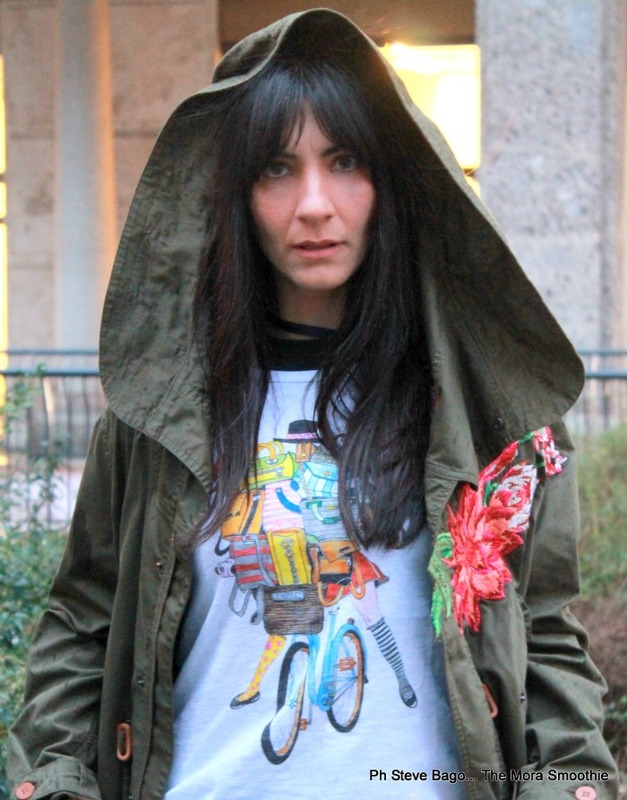 The Mora Smoothie fashion blog, DIY fashion by Paola Buonacara: Parka, jeans and T-shirt! Parka, jeans and a T-shirt. Un parka, un jeans ed una t-shirt. A parka with embroidered flowers, to give light to a rainy day, a T-shirt glamorous, colorful and full of bags ... and finally my new clutch bag covered with pins and patches. Un parka con dei fiori ricamati, per dar luce ad una giornata piovosa, una T-shirt glamour, colorata e piena di borse... e per finire la mia nuova pochette ricoperta di spille e toppe. I really like your colourful shirt, dear Paola! Bellissimo il parka cara, ottima scelta e questo look è perfetto stai benissimo! Stilosissima anche sotto la pioggia, bellissimo il parka!!! Loving that tough girl parka! So cool! Fantastico questo look…..la pochette è una meraviglia unica!!!! Oh, you look amazing! Your parka is stunning, so unique! HAve a great day! Very chic comfy and beautiful doll enjoy your Easter. Ecrù lace and perfored fabric for a chic look! Suzuki Vitara S ! Fashion car testing! Lace dress, multicolor jacket and my Stan Smith! Aigner Fashion Show FW16 at Milano Fashion Week!